Another of Faslane's Single Role Mine Hunters is shown here, passing McInroy's Point today. HMS WALNEY was launched on 25 November 1991, and commissioned nine months later. The fourth of the class, she was built by Vosper Thorneycroft at Woolston, as were all of her sisters. WALNEY was one of the ships which took part in the Trafalgar 200 Fleet Review at Spithead in June 2005. 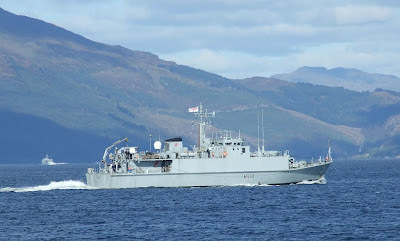 In the background, HMS PENZANCE can be seen exercising in Loch Long.